Hi, I am interested in your 1965 Pontiac GTO (stock #0447-NSH) listed on Autotrader for $34,995. I'd like to get more information about this vehicle and confirm its availability. Admit it, its the paintwork that first attracted you to this 1965 Pontiac GTO. It has a correct color combo that gives you a flashy red, but in a much more sophisticated presentation. And since this is a real-deal Goat with its original 389 V8 and four-on-the-floor, its allure is much more than just skin deep. Not only is this coupe striking, but it has the kind of story collectors love. Its a one-owner GTO thats spent its entire life in the Nashville area. The Montero Red and Cameo Ivory two-tone is part of the original factory-correct color package, and it has been through a professional respray gives it the kind of luster that makes people take notice. But that might not be what first grabs your attention. Instead, this GTO has a very well-coordinated package where the bumpers, headlight surrounds, hood scoop, and most of the other brightwork were painted a satin sliver. This coordinates with the upgrade to Mickey Thompson wheels, and so the overall impression is a much more uniform and sophisticated total package. Theres even a trunk luggage rack to really nail the Grand Touring aspect of this GTO. Theres more evidence of quality care and maintenance the moment you lay eyes on the correct parchment interior. The bucket seats are crisp right down to the correct arrowhead emblem embossed into each one. Matching door panels with correct GTO emblems and deep dark carpeting make this a true classic muscle car experience. Aiming for a more European feel in the GTO, Pontiac designers gave it a wood grained dashboard with the round rally gauge cluster that includes the very important tach. This car feels like a time machine as you grab the factory steering wheel with your left hand, and your right one will never want to leave the Hurst shifter. This one feels correct right down to the heat/defrost sliders and the AM radio thats still cranking out tunes. Pontiacs famous 389 cubic-inch V8 is a legend that launched the GTOs revolution, so we are happy to have the original, numbers-matching unit still in the engine bay. And while this motor has a great story, the thing people will do when you pop the hood at the car shows is gravitate to whats on top of this V8 first. Thats the allure of the famous tri-power setup of the trio of Rochester two-barrel carburetors. The original intake and carbs are still available, but what this big power configuration signals is this coupes true muscle car usability. In fact, the V8 was rebuilt within the last year to not only include tri-power, but also a hotter cam. You can take full advantage of the motor because the four-speed manual and the rear end were professionally rebuilt as well. So we know how much youre going to enjoy the extra crackle from the V8 as the dual exhaust howls with delight when you decide to drive this stick-shift muscle car legend to its fullest. Complete with original warranty card, this is the perfect mix of preservation and the right upgrades. Its a legendary muscle machine with added power and robustness, and the coupe has never lived outside of its hometown. 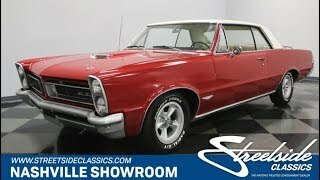 So now that you understand how special this GTO is, you know you dont want to miss out on the opportunity. Call today!! !